Rapid controlled expansion polymer tip! Supreme Ballistic SilvertipTM: Combines Nosler® Ballistic tips with the patented Lubalox coating for less friction. 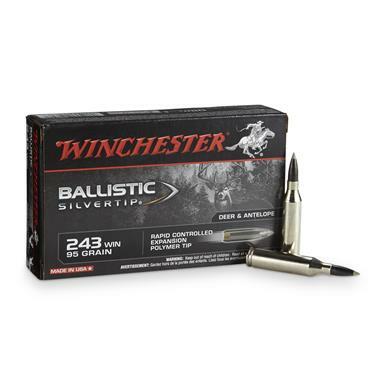 Winchester Supreme Ballistic Silvertip, .243 Winchester, BST, 95 Grain, 20 Rounds is rated 4.9 out of 5 by 21. Rated 5 out of 5 by RSTEW from Accurate and Hard Hitting The 168 BST's group excellent in Browning BAR and drop deer in their tracks. Rated 5 out of 5 by Anthony from Killer round! The Ballistic Silvertip is the most accurate and hard hitting round I've found for my A-Bolt. I'll never shoot anything else.